Hey all! I guess this is my first real post here. I recently purchased a Mitsubishi XC-2930C and had it freight shipped from Texas. It seemed to have arrived safely, but I can't vouch for the journey it may have had. I am going to give you a rundown of the symptoms I experienced to see if any of you can help me narrow this down. My apologies for the long post - I'm just going to lump everything together! 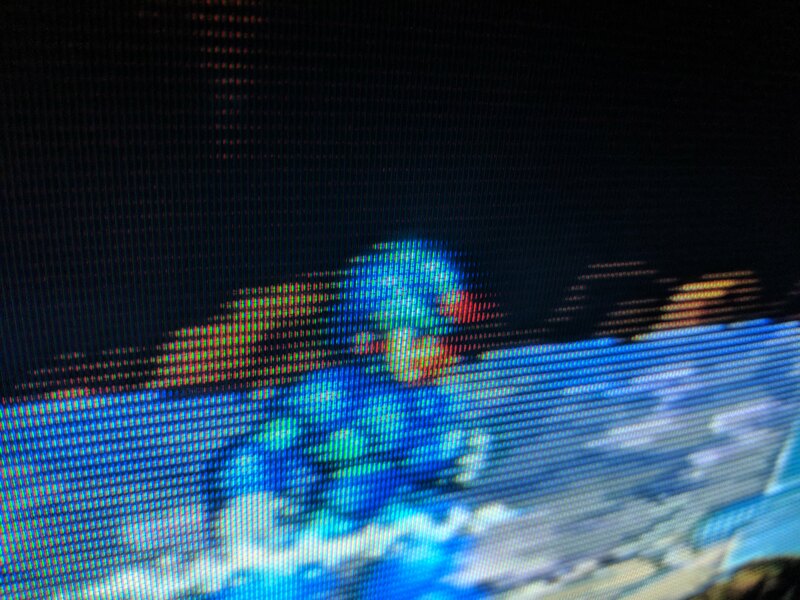 When I first turned it on, I used a SNES with RGB (4x BNC). I know my cables and consoles are fine because I was testing them on my Ikegami HTM-1917R to make sure everything was good. I wasn't getting any signal at all, even though RGB 1 was selected as the input. All of the switches near the BNC inputs were set to 75Ω. 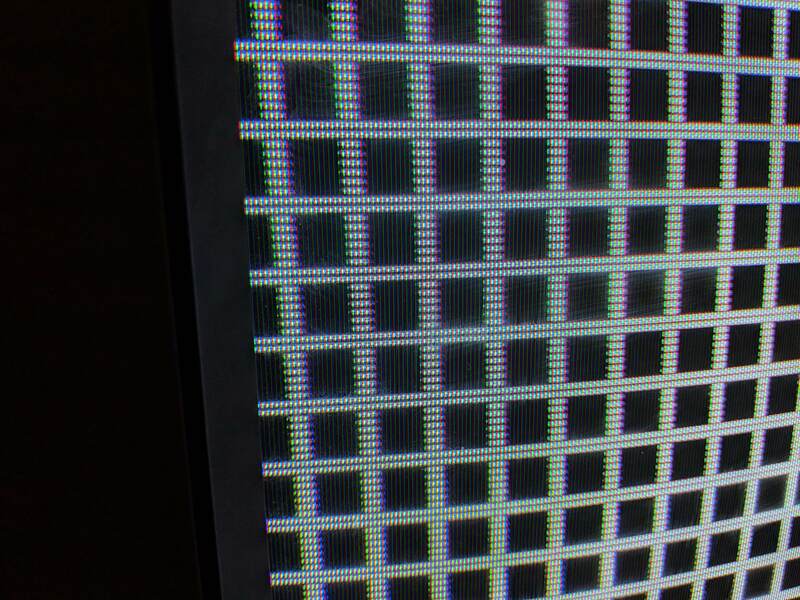 Out of curiosity, I hit the left side of the TV, and the signal came in! However, there was a deafening whine (not your typical 15kHz flyback transformer whine). After hitting the left side of the TV again, the whine went away and never came back. After a few minutes of playing, the signal dropped out again. I hit the side of the TV once more, and it was all fine! Since this whole debacle, the signal has never dropped. However, when signal is synced to the TV (whether it's 15kHz or 31kHz signal), there occasionally will be a deafening whine sound. You figure this wouldn't happen at 31kHz since it would be outside of my hearing range, but it was the exact same sound as using 15kHz signal. This sound coming in is random and it will usually go away by itself after about 10-15 seconds. Is this a flyback transformer issue? I can't imagine anything else that would make that sound. The flyback transformer is located on the back right of the TV, but hitting the left side still makes it go away. The two boards on this side are the DEFL and DEFL SUB boards. Another issue (which seems to be my main issue) is the fact that my horizontal width seems to act inconsistently. For 15kHz content, I am able to set my H-WIDTH to about 55 or 56 and it fills the screen entirely. However, I had an issue with 480p content not being able to fill the screen at all. Even with my H-WIDTH maxed out (64), it wouldn't fill the screen. 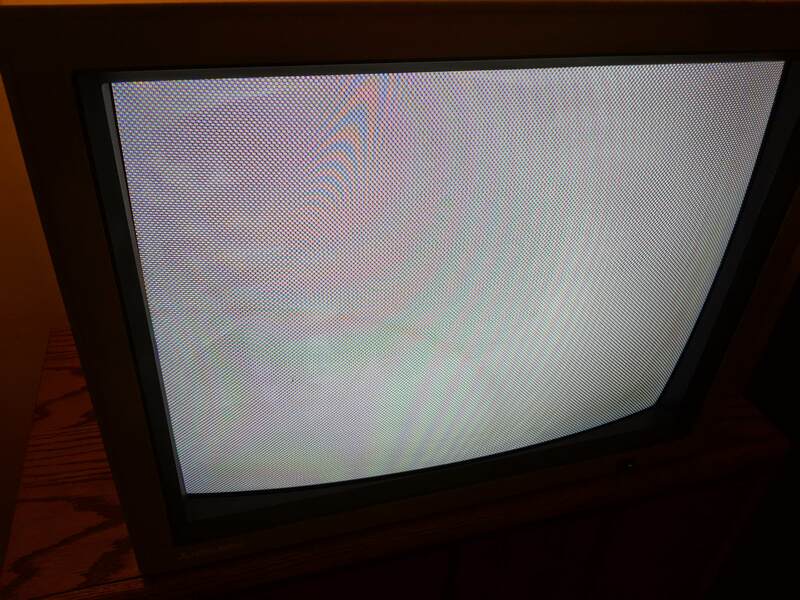 After doing some research, I was able to figure out that I could flip the S207 switch inside the CRT to switch the settings menu over to the "advanced" version. For the 480p preset, it seems that the SUB-WIDTH was set to 15. After setting it to 30, I was able to go back to the "normal" settings menu and set the H-WIDTH to 63, which filled the screen entirely! It was a bit worrisome that I had to max both for it to fill the screen, but it was stable (after saving the settings to the preset). However, I had to move the TV onto its newly purchased (and very sturdy) TV stand, and after plugging it back in and turning it on, it seemed that the width of the picture was a lot narrower! I check the menus and the H-WIDTH and SUB-WIDTH settings were exactly the same. Now, not even my 15kHz content filled the screen at max width. Usually, when I disconnect the signal, the blank blue screen with the input displayed fills the screen. Now, not even the blue fills the screen all the way! Here's a video of what I'm talking about (signal in video is 15kHz). P.S. I remember this happening a few times when I was first messing around with it - the horizontal width would sort of be random upon turning it on. Each time the horizontal width would change, there would also be a random geometry issue on the left side (that would go way next time the width changed). Is there a way to adjust the horizontal linearity on this set? I was reading both the operation and service manual and was not able to find anything substantial. Upon displaying a grid pattern, the squares on the right side of the screen are a bit smaller than those on the left. With side scrolling games, content coming in from the right side of the screen seems to warp in. This one might be hard to see through the regular moire of viewing this on a screen, but if you zoom in you can kind of see this rainbow-like pattern. 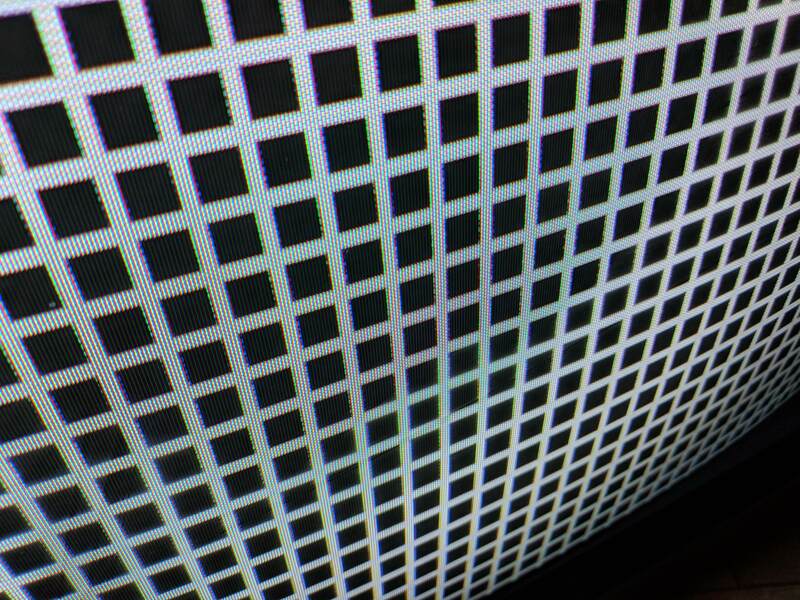 It's visible when I'm gaming, although not as much as this checkerboard pattern. Adjusting the MOIRE setting changes its positioning but doesn't really get rid of it entirely. Making other assorted geometry adjustments (like pincushion) change the pattern but still don't rid of it. Deguassing doesn't fix anything. Okay, last one! 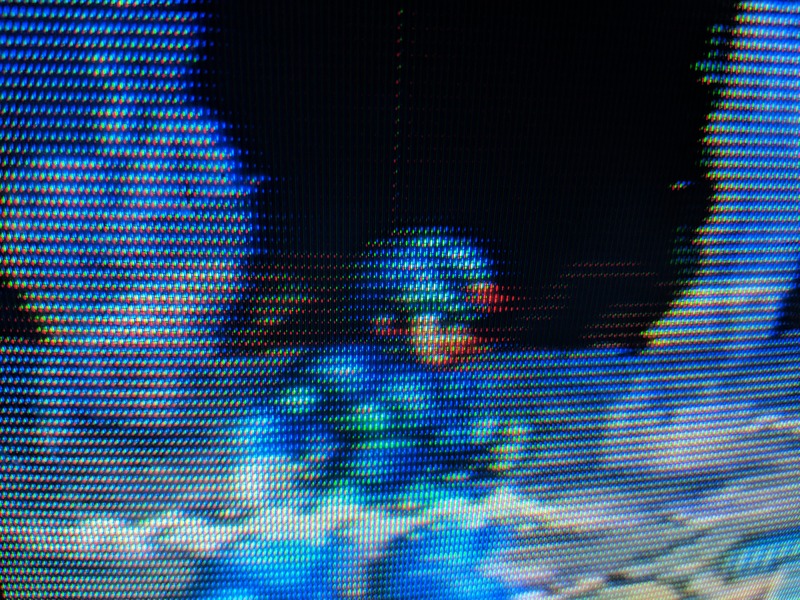 The scanline definition towards the edges of the screen is a lot higher compared to in the middle of the screen. Adjusting both focus pots on the flyback transformer did not fix this. Below are some images comparing the edge of the screen to the center of the screen. Thanks for the help, by the way ! I know this is a lot for one post, but maybe some of the issues are related. Have you adjusted purity on a blue screen. Then a white screen? That should help with your Moire issue. Also composite settings are not saved on these sets. Only settings made to RGB inputs. I have not tried adjusting the purity, but I'll do that soon! Thanks for the tip. Bumping this thread! The main issues I'm having are with the screaming flyback(?) sound and the horizontal width inconsistencies. I basically need to figure out if the DEFL or DEF-SUB board is causing the issue - I might have access to some spare boards! If your settings are not saving I would look around around for a battery mount on the PCB's. "Insulated 12kv High Voltage Electrical Insulating Gloves For Electricians"
Look for mount points on fly back transformer. If they are able to be tightened on the mount you can fix this issue. Most of the time it because your magnetic circuit has been overheated and loosened and corroding. If this is the issue then you will have to cope with it and either schedule a warm up period or continue hitting it. I would double check your Scart switch and cable quality before you rule it out. I recommend Banbrige and Retroaccess cables. My settings are indeed saving! I did some more testing with it this morning and I'm 99% sure it's a capacitor issue, as the picture eventually fills the screen horizontally after about 5-10 minutes of use. I just gotta figure out if it's the DEF-SUB board or the DEFL board and either recap it or replace it. Thanks for the tips on the flyback stuff, by the way! I'll open it up and take a crack at it sometime in the near future. My cables and components are tip top and I have used them with other monitors with zero problems.